A new book on the music distribution service claims it is. Spotify Teardown claims that the streaming service is sending (and receiving) much more than music. The authors contend that the service is engaged in emotional manipulation given their playlist emphasis. Music is only the surface layer of a much larger data collection and advertising infrastructure. It started with geotracking. As smartphone owners realized we were being tracked, privacy concerns flooded our consciousness. Some acquiesced: Who cares if I'm offered a coupon while walking by a store I like? Most outrage has been tamped down by the addictive nature of the device. We seem to have accepted tracking as part of the bargain. Plus those disclaimers have too many words. But the layers keep unraveling. Laptop cameras snapping unsuspecting candids. Alexa listening in on conversations. Your light bulbs sending sleep data to Google and Amazon. Every device and app appears to have ulterior motives. There's a reason app developer is the "fastest growing six-figure job." In an attempt to monetize every second of every day, everywhere, imagine this scene: You walk into a store, which has a deal with Amazon to track what items you regularly purchase. As you approach that department, the store checks in with Spotify to discover your most played songs. Since your spending habits are higher than other customers, the store's soundtrack immediately updates to reflect your favorites. This little dopamine boost ensures an open wallet. To my awareness this is not reality—yet. But it's coming. While privacy concerns are aimed at Facebook, Google, Apple, and other big players, we seem to have overlooked one of the biggest private data brokers around. Spotify passes as a music distribution service, yet there's much more being sent through your speakers. Rather than being an autonomous actor with the power to shape the future of the music business, Spotify exists at the intersection of industries such as music, advertising, technology, and finance. Daniel Ek, chief executive officer of Spotify, speaks about a partnership between Samsung and Spotify during a product launch event at the Barclays Center, August 9, 2018 in the Brooklyn borough of New York City. The historical analysis alone reveals a suspect future. Spotify's founders, Daneil Ek and Martin Lorentzon, never worked in the music industry before founding the company in 2006. Perhaps unsurprisingly they both came from advertising technology. Incredibly, the service launched with no song licenses; like their Swedish counterpart, The Pirate Bay, Spotify was effectively an illegal file-sharing service for a full year-and-a-half. This recent history seems generations ago. Major complaints today include notoriously low payments, major label ownership, and pro rata revenue share, meaning that revenue is divvied up by how many tracks are currently being streamed at every moment, which favors more famous artists on larger labels. As I listen to American-Kenyan band Extra Golden while writing this article, Ariana Grande is getting paid more money per stream simply because more people are listening to her right now. How is a song "streamed" in the first place? Actually, it's not. 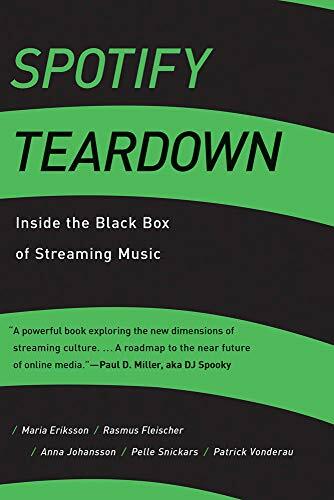 Rather than "streaming," the authors write, Spotify is "aggregating" by uniting "distinct data particles into a coherent whole." Though the service is protective of its processes, information provided by the company revealed that only 10 percent of music playback originates in its own servers; 35 percent from P2P networks; and a whopping 55 percent come from local caches. This squares with a 2015 survey claiming that a majority of Spotify listeners stop listening to new music after age 33. Decades of internet research have revealed that we're more predictable than we'd like to believe; musical choice is no different. Due to the construction of our brain, music we listen to as a teenager tends to remain our favorite for the rest of our lives. Such data help advertisers pinpoint emotional responses to specific stimuli; an album becomes a gateway to sales across industries. Such crass commercialization of a sacred act. Music is an integral part of our identity. The communication system we call language likely began as music. The ritual of music is ceremonial in intent, designed to invoke and inspire the emotions of a community. Spotify initially marketed shared experiences as a motivating factor for using their service, but over the years the Swedish company has gone the way of America with its hyper-focus on the individual. The AI-driven Discover Weekly, Release Radar, and Daily Mixes are all based on personal listening habits, which self-reinforce the more you remain within your lane. Curated playlists, the authors note, also tend to skew happy—the more you enjoy upbeat music, the more likely you'll stay listening, sad songs be damned. Music recommendations, then, can be understood as products for mood enhancement and the management of psychological capital. Which brings us back to the beginning: Is Spotify a music streaming service or a data hoarder? There was outrage when Facebook manipulated the moods of its users, yet Spotify regularly attempts the same. Their focus on happiness is emotional manipulation. When you discover what a stream—an aggregation—really entails, the information proves even more troublesome. The "intimate relation" personalized playlists evoke, the authors note, "is monetized at the very moment when users click play." Music is only the layer you hear above "a cacophony of other data." Using browser plugin Ghostery and network data capture tool Fiddler, the authors worked with a programmer to discover no less than 22 mostly advertising-related companies in that cacophony, tracking listening habits and providing real-time analytics. This data is packaged and resold. As the rush to capture and capitalize data continues, every application seems to be in the race. The one safe haven left—the ritual of music, the shared experience between artist and fan—is now monetized at every turn. A pittance goes to the creators, while the price the fans pay is steeper than any of us imagined.